The Saskatoon Sexual Assault and Information Centre held their annual fundraiser on Friday. It included police officers modelling on a runway. 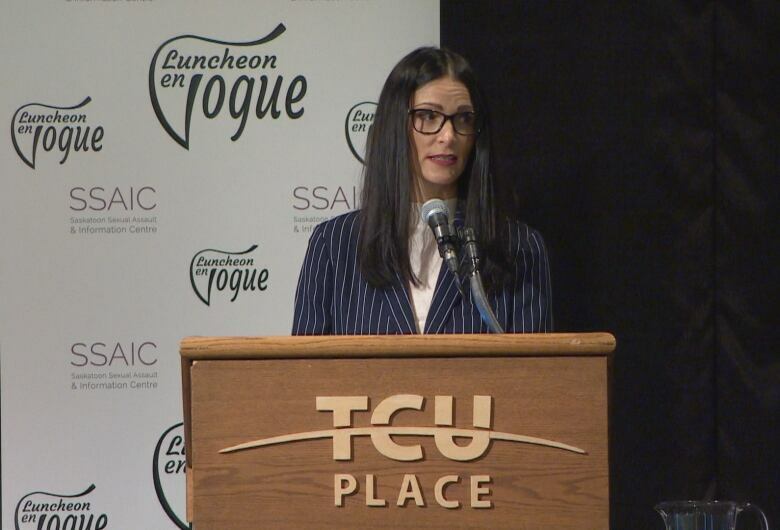 An annual fundraiser put on by the Saskatoon Sexual Assault and Information Centre (SSAIC) is a chance to acknowledge the courage and resiliency of people who have survived sexual violence, according to the centre's spokesperson Megan Evans. SSAIC celebrated their fundraiser for the 15th year in a row on Friday at TCU Place. Evans said the event is aimed at raising funds for the centre and increasing awareness about sexual violence. 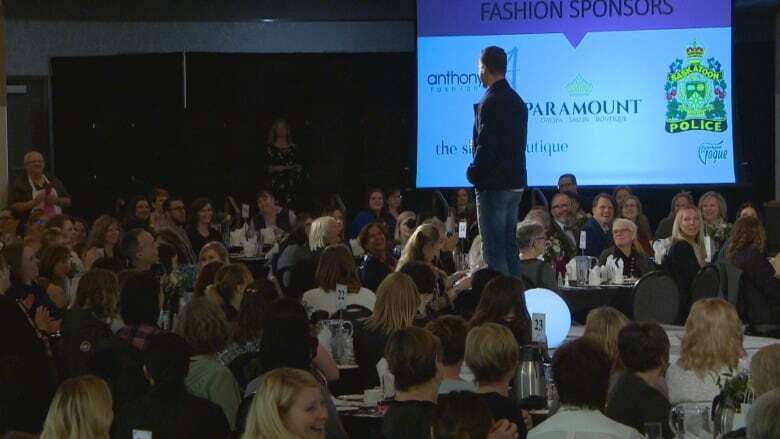 It has become known for its fashion show, which includes several Saskatoon police officers strutting their stuff on a runway. But this year's event also included an emotional story of pain and healing from a survivor of sexual violence. According to Evans, this year's event sold out. "We do work really hard to strike a balance between a little bit of public education on a very serious topic, but also just kind of celebrating the efforts of our centre and the work that we do," Evans said. "Celebrating the courage of survivors and their own resiliency." She said it's also a chance for SSAIC to connect with the community and raise awareness, so survivors know about the centre. "Our services are free of charge so that's really important for everyone to know as well," said Evans. Overall, the "event was spectacular" and everyone left happy, she said. SSAIC is currently struggling with a funding shortage, according to Evans. The provincially-funded organization has seen a drastic increase in demand over the last few years, with over 540 new clients in 2017-18. Evans said that has led to increased waiting times for people who need help as soon as possible. SSAIC also had to cut its hospital support program in May for budget reasons, but Evans said the Saskatchewan Health Authority has stepped in to help fill that service. 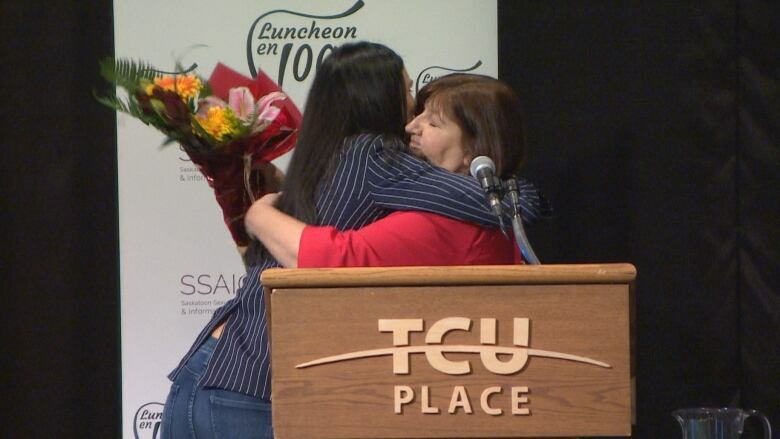 The province couldn't be reached for comment, but in May, CBC News reported that the Government of Saskatchewan provides $1.2 million each year to SSAIC and six other centres in the province. Saskatchewan also provides $3.9 million to police-based victim services, which includes help for victims in court, such as supporting people and using video conferencing to allow a victim's testimony to be given from outside the courtroom. SSAIC has received $489,000 in funding from the provincial government every year for the last three years. Funding will continue at the same rate for the next three. SSAIC is encouraging anyone who has experienced sexual violence to visit their website or contact them at 306-244-2294.